Historian and Professor Charles Dew to Speak at W&L Founders Day/ODK Convocation Dew’s speech, titled "The Making, and Unmaking, of a Racist," will precede the ODK induction. Charles Dew, the Ephraim Williams Professor of American History at Williams College, will be the featured speaker at Washington and Lee University’s Founders Day/Omicron Delta Kappa Convocation on Jan. 18, at 5 p.m. in Lee Chapel. Dew’s speech is titled “The Making, and Unmaking, of a Racist.” The talk is free and open to the public and the program will also be broadcast live online. Dew’s address will precede the induction of undergraduate students, law students and honorary initiates into membership in Omicron Delta Kappa, the national leadership honor society for college students, faculty, staff and administrators, founded in 1914 at Washington and Lee. The University Singers will perform. Dew has taught at Williams College since 1977. 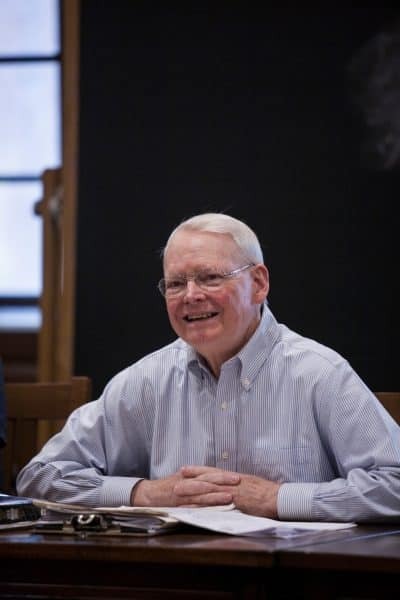 He is a nationally recognized scholar of the American South, the Civil War, American slavery and the Reconstruction period, and he has taught generations of students in his classes at Williams over the past 40 years. “Charles Dew is a prime example of the teacher-scholar and a courageous writer who focuses on the most searing tensions in the American past and present,” said Marc Conner, provost at Washington and Lee. Dew’s first book, “Ironmaker to the Confederacy: Joseph R. Anderson and the Tredegar Iron Works” (1966), received the Fletcher Pratt Award for the finest book on the Civil War published in that year. His second book, “Bond of Iron: Master and Slave at Buffalo Forge” (1994), was a finalist for the Lincoln Prize and was selected by the New York Times Book Review as a notable book of the year.